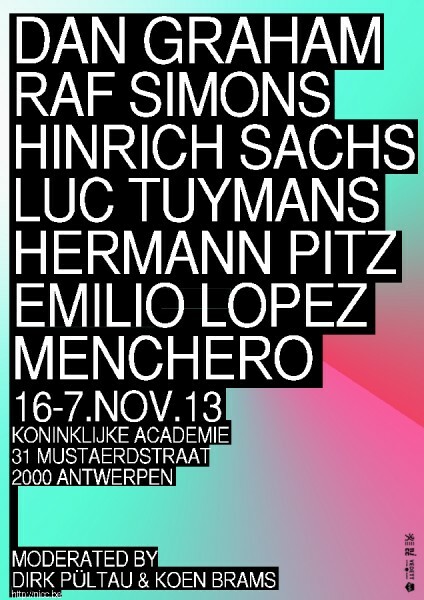 On Thursday the 6th and Friday the 7th of November, the NICC organizes a two-day international symposium in collaboration with Universiteit Antwerpen, ModeMuseum and Koninklijke Academie Schone Kunsten Antwerpen; ‘TO TEACH OR NOT TO TEACH. Questioning the Art School'under '. Koen Brams, Dirk Pültau and Johan Pas discuss the position of the self-taught artist and the art school with artists : Dan Graham, Luc Tuymans, Hinrich Sachs and Hermann Pitz. 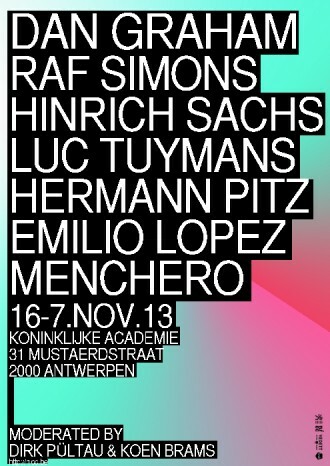 This simposium is organised in relation to the exhibition "de autodidact", An exhibition by NICC with works by Belgian self-taught artists : Ria Pacquée, Luc Deleu, Dennis Tyfus, Jacques Charlier, Guillaume Bijl, Pierre Bismuth, Joaquim Pereira Aires, Charlotte Beaudry, Guy Rombouts, Paul Van Hoeydonck, Philip Van Isacker, Jan Fabre, Marcel Maeyer, Francis Alÿs, Walter Swennen.